Thank you for your interest in Prince Aircraft Company. 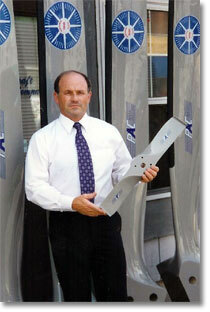 I'm Lonnie Prince, I founded Prince Aircraft Company in 1979 as a part-time business in the basement of my home. During that time I worked full-time as an Air Traffic Controller, building my own experimental aircraft, flying corporate aircraft, and President of our local Experimental Aircraft Association Chapter. After the 1981 Air Traffic Controller strike I began manufacturing propellers as a full time occupation. My manufacturing capability was only three propellers a month, all being hand carved. We certainly have grown since then. Today we are a company of several employees and have the capability to manufacture in excess of one hundred propellers a month. Using sophisticated tracing as well as Computer Numerically Controlled carving equipment. I am proud to say we have manufactured nearly Seven Thousand propellers for customers around the world. The Prince P-TIP Propeller is unique. It has many features not normally found with a fixed pitch propeller, including automatic pitch changing and anhedral. The Prince P-TIP Propeller is an investment in outstanding performance, efficiency, reliability, and noise reduction; all this and our outstanding workmanship too. One of our most important tenets is respect and fairness to the customer. I consider every customer my superior and make every attempt to show the ole’ fashion respect and honor we remember of years past. You will find our business practices the most outstanding in the industry. If you are willing to invest your money, then my opinion is, you are trusting us to design and manufacture a propeller that will be the correct match for your performance envelope. Should there be a requirement for enhancement, we will rework the propeller; fine-tuning to correct any performance requirements. If we deem necessary a new propeller will be manufactured at our cost less shipping. I hope you find this website useful. The attempt of this site is to anticipate your questions and provide detailed answers during your propeller selection. You will find this site easy to navigate with a Propeller Selection Wizard that steps you through choosing your propeller, options, and cost. Also you will find Customer Comments, Frequently asked Questions and details about our products. You can place an order or ask further questions. Thank you so much for considering the Prince P-TIP propeller for your application. If you have a question, or have a requirement not listed please contact me, we manufacture for nearly every application that requires great performance.